The young members of Halifax Thespians will get their turn in the limelight from February 24 to 28 when they present Willie Russell’s ‘Stags and Hens’ at Halifax Playhouse. Set in a rundown nightclub, the adult comedy features a couple who have both unknowingly chosen the same venue for their stag and hen nights. 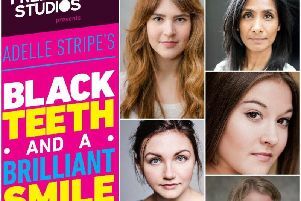 The cast includes Amy Neill, Amber Gilmour, Phoebe Farrington, Paige Fletcher, Martin Walsh and Luke Elam and the director is Mike Bellenie assisted by Kerry Lawrence. The play is at 7.30pm with a Saturday matinee at 2.30pm. Call 01422 365998 for tickets. l Halifax Thespians are looking for a West Indian or Asian actress to take the role of Rose in their forthcoming production of ‘Stepping Out’. She should be in her late 30s to early 50s and be able to tap dance to a reasonable standard. The play is being staged from June 16 to 20 and rehearsals will begin in April. Anyone interested should ring Derek Smith on 01422 616149.